How does one begin to make sense of everything after being diagnosed with cancer? I know from witnessing some of my close family and friends deal with cancer, facing death is truly devastating. 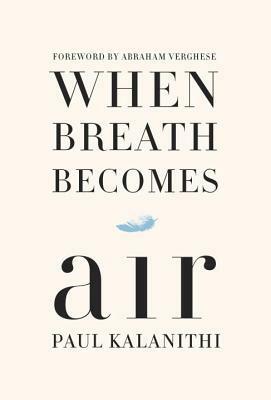 When Breath Becomes Air is Paul Kalanithi’s heartfelt journey as a medical student, as a neurosurgeon at Stanford, and then as a cancer patient. I found this to be an incredibly moving read. Dr. Kalanithi’s memoir offers the perspective of both doctor and patient and of the doctor/patient relationship. Being a neurosurgeon, he knew exactly what was coming when he was diagnosed with cancer. It still didn’t make things easy for him or his family. Dr. Kalanithi was a man with a brilliant mind who had a zest for learning and a love for literature. I was engaged with reading how he faced death head on. A dear friend recommended this book to me while we were taking one of our long walks, chatting about books and life. I had read a few cancer memoirs before, and I always appreciate each person’s unique situation and viewpoint. Dr. Kalanithi’s writing is deeply poignant and will make you think, if you haven’t already, about death and dying and your own mortality. Paul Kalanithi died in March 2015, and his wife’s words in the epilogue will make you cry. Thank you to Paul and Lucy for sharing your touching and memorable story with the world. The When Breath Becomes Air audiobook is narrated by Sunil Malhotra with the epilogue being read by Cassandra Campbell. Both narrators deliver clear readings with good pacing. Having listened to and enjoying one of Sunil Malhotra’s narrations before, I was delighted to learn that he was the main narrator for this book. Despite the sad tone, listening to this audiobook continued to be an enlightening experience.